The next time you log into the Adobe Stock Contributor portal you should notice a few changes. At the top of the portfolio page you will see a 12 week trend showing your sales from the past 3 months. 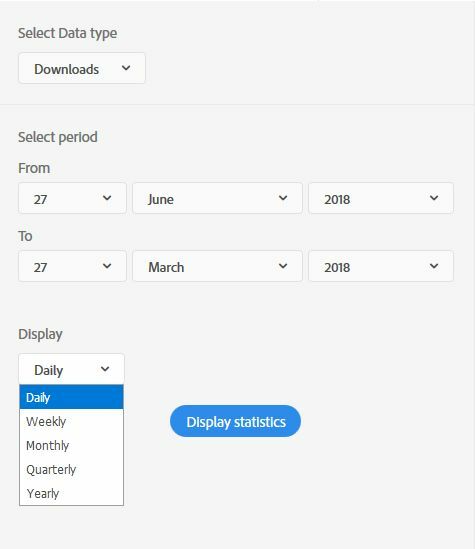 In addition, the sales tab has been replaced by the "Insights" tab where you will find your sales history and the option to check your sales, downloads and tax withholding statistics for custom date ranges. You can view this data in the portal and download a csv file with the information as well. We expect to expand this feature in the coming months. As always, your feedback is greatly appreciated. edit: that seems to be the case always - you need to put the 30th in the top field and the 1st in the bottom field. Just awkward. And the opposite of the Fotolia stats way of doing it. Problems to sign in Safari and Firefox. Temporary bug? I completely agree that the date order is backwards - rather than flip the order, why not just have it accept either order (which will set the initial sort order of the results). None of the columns let you change the sort order; putting monthly sales in a vertical column on a horizontal screen means you see mostly white space and not the thing you want to look at; you can't see the two main things you want to see together - money & downloads. You can't (as far as I can tell) see the total sales (downloads & $) for an individual image anywhere. It'd be nice to see some long desired features get added as well as (at a minimum) port all the Fotolia stats features over to the Adobe side. Honestly looks like whoever designed this isn't a contributor and didn't talk with a contributor about what would be helpful. Thanks, it is nice to see some progress in this department as what was there before was really really limited and I for one can't see the Fotolia stats. I haven't fully tried to get useful stats out of this, but asking a few contributors about what they really want to see would probably be a good idea - don't do what SS did and hide the useful info and put the much less useful info all over the top in massive bold text. I'd love to be able to see total sales, $, and views for any image as well as overall sales and $ for any given time period. The from and to order seems backwards to me, but I am a geologist so I can deal with stratigraphic order if I have to. Now to go back and find where the small accounting discrepancy in my records compared to what AS has reported is. I agree with others above. All feedback and suggestions duly noted. Thanks everyone. I would like to see greater control over the time period. I would want to compare months (rather than just weeks) and also compare one month to the same month of the previous year. I would also like to see stats around keywords searched on for each file. How did the client find the image, what keyword brought them there. Nice start.... but, it really is very, very basic at the moment and wouldn't really gain much interest compared to the FT data. That data can be downloaded and used for my accounting whereas the AS stats at this point don't come close to being able to do that. Did this all change? I see the current date on top and selection for how far to go back on bottom. Makes sense. Also many choices? After a few days I've been experiencing issues in Adobe contributor page. It's working well .You've noticed. I tried a "From" date of Dec 2017 with various "To" dates of 2018 and it just returns "Please enter a valid time range." In fact, any date. Hence the reason for my first post. Turns out the "From" date has to be more recent that the "To" date?!? Seems backwards, surely "From" is the earlier of the two dates, and "To" is the end date.....like it is with FT data page! That could do with being changed round to avoid confusion. Just assumed it wasn't available yet. I can't believe you kept the old Fotolia way of displaying sales, probably the worst of anywhere. Why can't I just have all the details (DL & $) in one neat graph? I can't believe i had to come here to find out that the date order needs to be flipped. Hoping for more also. The From is backwards, from is most recent, to is back in time. But I suppose looking back, it could make sense. But if someone wanted to know what they made in 2016 it makes more sense to look at from Jan. 1 2016 to Dec 31 2016 which is normal and logical. I don't know if the words searched is in the data, but individual file stats, sales, earnings, would be useful. Are you using different time zones for earnings / downloads and activity? Activity shows no sales July 5th, earnings and downloads show at least one. So I went to check the statistics, and what I've noticed is, that my all-time total downloads, showing at Adobe site are different from those at Fotolia site. Adobe site is showing me 1 download more than Fotolia site. I will look into the time zone and let you know what I find out. Thanks for bringing this to my attention. Its so badly done its beyond words! at FT you get some grainy horrible pics and at Adobe you just get a diagram and cant even find the account. What clown have designed this? cheapo stuff! Thanks again for bringing this to my attention. I have confirmed there is a time discrepancy with the different stats. The development team is aware and we expect it to be synced up in the future. Thanks Matt! call me old fashioned but I still think the old Fotolia site was much better! I miss the Fotolia portal. It wasn't perfect, but much better than this awful Adobe Stock design. For instance, the Adobe Stock contributor portal has way too much whitespace, which makes it hard to read. See attachments for my comments on some of your design flaws. Including a redesign of the download stats page. I still think the old Fotolia site was much better! Yes, yes, yes ... almost in every respect ... AS is a terrible disimprovement for contributors ... and not much better for buyers. It would be pretty cool if on the activity page after this specific sale it also listed all times sales #s and $s for that item and maybe upload date (although that can be estimated from the id # I suspect). Or maybe have a bunch of columns you can select and turn on and off. Also a place you could list all of the stats ($, download #, withholding etc. all on one graph with over various times - day, week, month, yr would be nice. Unable login to adobe stock contributor portal. Bad Behavior has blocked 57777 access attempts in the last 7 days.